Share some sweet love and gratitude with this hand-carved spoon. When someone makes you a special dinner or bakes your favorite treat, you can almost taste the love. Give back a helping of that delicious feeling with this handcrafted wooden spoon. Made by a collective of artisans working in rural Kenya, it's carved from African wild olive, a variety of hardwood that is both durable and beautiful. Lovely enough to be kept out on display, put it to work scooping loose leaf tea or coffee grounds, stirring sauces, or scooping cocktail party snacks. Whatever it becomes, it will always remain full of your gratitude toward that special hostess, friend, or mother who receives it. Handmade in Kenya. Hand wash with mild soap and water. Lay out to air dry. 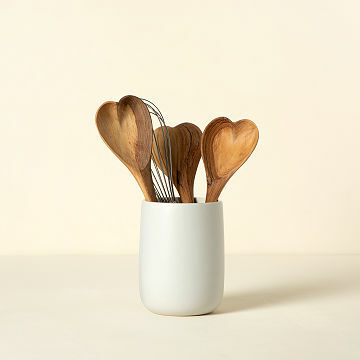 Occasionally, help condition and preserve your Heart Shaped Serving Spoon with our Mineral Oil. I first saw this spoon YEARS ago pictured in a local business's ad. It was just a picture; they didn't carry the product. When I saw the spoon in your catalog, I immediately ordered TWO â€¦ for my great-nieces who are getting married this year. I hope the spoons are well-received because I think it is a unique wedding gift. Especially with the wedding date engraved on the handle (by local woodworker). So cute for a Valentine's Day gift, Anniversary gift or Housewarming gift. Well made and great size for display or useage. Everyone at the bridal shower loved this spoon. I can't speak as the end user but I fancy myself a gift giver and this was the perfect final accent to a wedding gift for a lovely couple. Clever adaptation of an everyday household item. It looks great in the kitchen. Large capacity too! This was the perfect gift for my friend who loves to cook!